According to a groundbreaking new study, preschoolers with gas appliances in their homes scored lower on cognitive tests and were more likely to have ADHD than their peers. Researchers visited the homes of 482 babies in the first twelve weeks of life to count gas appliances in the homes and to install a device to measure average nitrogen dioxide levels in the kitchen over a two week period. Nitrogen dioxide is an odorless gas that can be released from cooking on a gas stove. Later, when the children were four years old, researchers performed detailed testing of their intelligence and behavior. They found a direct relationship between the number of gas appliances (especially unvented gas appliances), the level of nitrogen dioxide in the indoor air, and the odds of having ADHD (especially the inability to pay attention). They also found slightly lower scores on cognitive tests (especially on tests of verbal intelligence and on executive function). These associations remained even after adjusting for other potential factors such as breastfeeding, smoking or drinking during pregnancy, educational level, or income. The researchers also took DNA samples from the babies, looking for a gene related to the ability to detoxify certain environmental pollutants (the glutathione gene GSTP1). The antioxidant it produces can help to prevent damage from nitrogen dioxide and many other compounds. About half of the children were genetically less able to deal with exposures such as this. The associations in the study were much stronger for those children. As an example, with children who had two gas appliances (e.g., a gas stove and a gas fireplace) and the protective form of the gene, they just have a typical chance of having ADHD and they score an average of only 2 points lower on general intelligence tests than their peers without any gas appliances. However, children without the protective gene but with the same exposure were almost seven times more likely to have ADHD by age 4 and scored about 10 points lower on intelligence tests than their peers: about 0.5 points lower for every 1 ppb of nitrogen dioxide that had built up in their indoor air. The gene made a big difference. So did the amount of nitrogen dioxide. This appears to be the first major study of indoor air pollution and brain function. It’s important, but far too soon to draw firm conclusions. Moreover, the study was done in Europe, where there are countless differences from here in the homes and lifestyles. Even if the study were repeated here, and similar results found, this would only show an association between these things – not necessarily that one causes the other. Nevertheless, there is a growing body of evidence linking outdoor air pollution with brain development. And there is strong evidence that for most homes indoor air pollution is worse than outdoor air pollution. And we do know that nitrogen dioxide causes cell damage and provokes an inflammatory response. Keeping indoor air clean seems wise, whether or not we have gas appliances. I don’t recommend rushing out to change your appliances. I do recommend being sure your gas stove (and other gas appliances) have a fan and vent to outside of your home. 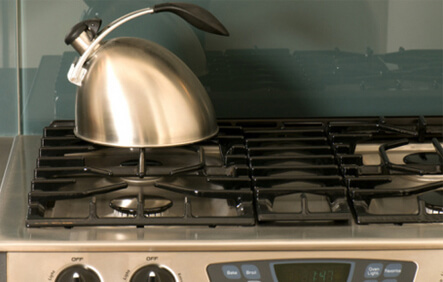 Use your fan and vent when cooking with gas. Consider a spider plant in the kitchen! Senior research scientists from NASA tested the ability of spider plants to remove nitrogen dioxide and other pollutants linked to gas appliances from indoor air. They found that a single spider plant potted in a one gallon container could remove >99 percent of the nitrogen dioxide that had built up — within just six hours. I suggest one in every room where gas is burned. You may want two if the room is larger than 800 cubic feet (10 feet by 10 feet with 8 foot ceilings). This is an inexpensive, green insurance policy. Other plants may work just as well, but this is the only one I know that has been carefully tested for removing nitrogen dioxide. Bring fresh air into your home. Open windows when you get a chance – especially in the kitchen and especially at times of day when your impact on heating or cooling bills is low. Make fruits, vegetables, or whole grains a part of every meal. The antioxidants in the food we eat are an important part of our bodies’ ability to prevent and repair damage, including this kind of damage – but most of them don’t last for more than several hours at a time. Each breath we take deepens the link between the environment and our bodies. Sometimes air pollution feels like it’s beyond our control. There’s more evidence all the time, though, that the most important air quality is in our own homes – especially for young children. Here we can make a difference, and it can be easy, inexpensive, and refreshing. Wolverton, B.C., R.C. McDonald, and H.H. Mesick. Foliage plants for the indoorremoval of the primary combustion gases carbon dioxide and nitrogen dioxide. J. Miss.Acad. Sci. 1985, 30:1-8.